I had a request for something a different this week so I though I would try something new too. It would have been amusing to watch me do this I am sure. I did manage to make it work, although a full sized ink pad is recommended :). I brayed the background, I created a small hill with a torn sticky note as a mask. Once the ink was dried I stamped the tree. To create the sparkle on the bottom had I reversed the mask and used Antique Frosted Glass Embossing powder. I added a few frosted snowflakes and added gems. 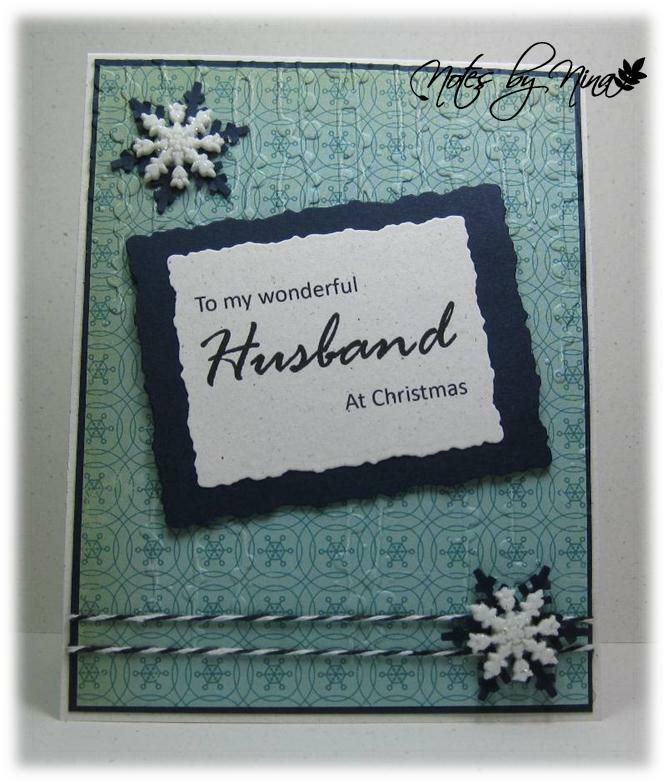 The sentiments were created in MS Word them printed off, I them embossed them with Frosted Glass Embossing powder. Supplies: Natural white and navy cardstock, KanBan-Spring Silhouettes, misc gems, Frosted Glass embossing powder. Merry Christmas everyone, no I am not crazy for posting early today I promise. I am the only one awake yet and I am enjoying a tea before the day starts. I usually create a grand and detailed card for my sweetie, this year I went with simple. I added some texture to the background, and kept the sentiment clean. I finished with some twine and snowflake embellishments. My sister Barb created the sentiment for me with some magical designer program she uses. Supplies: Cream and navy cardstock, Designer Paper –October Afternoon, twine, snowflake punch, snowflake embellishment. It was a pretty quiet drive into work this morning, I am sure that will not last as people scurry around trying to do last minute preparations for the big day tomorrow. We have a potluck lunch today at work, there is will be no escaping all that wonderful food... I can't wait :). I have had a few friends and families transitioning to new places the past few little while. This card is for a friend and her family who purchased their first house this month, how exciting to spend Christmas in a new home. 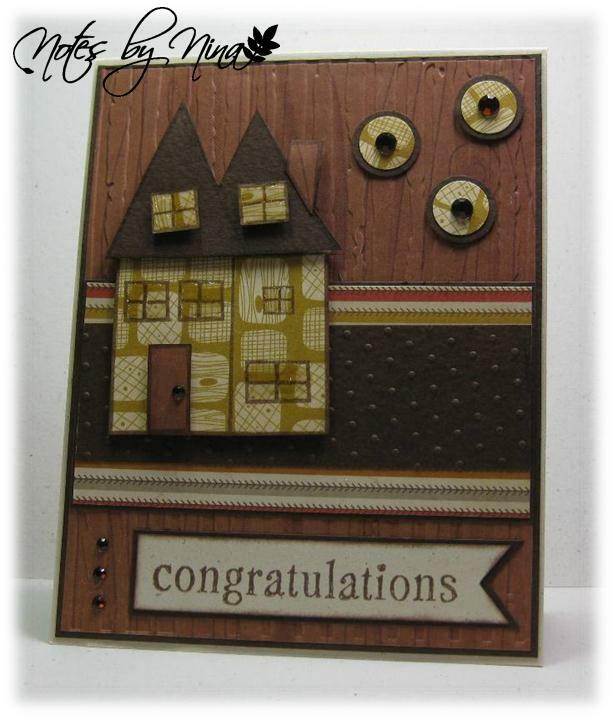 I paper pieced the house and added some texture to the background. I finished with a little diamond glaze on the windows and a few button like embellishments. 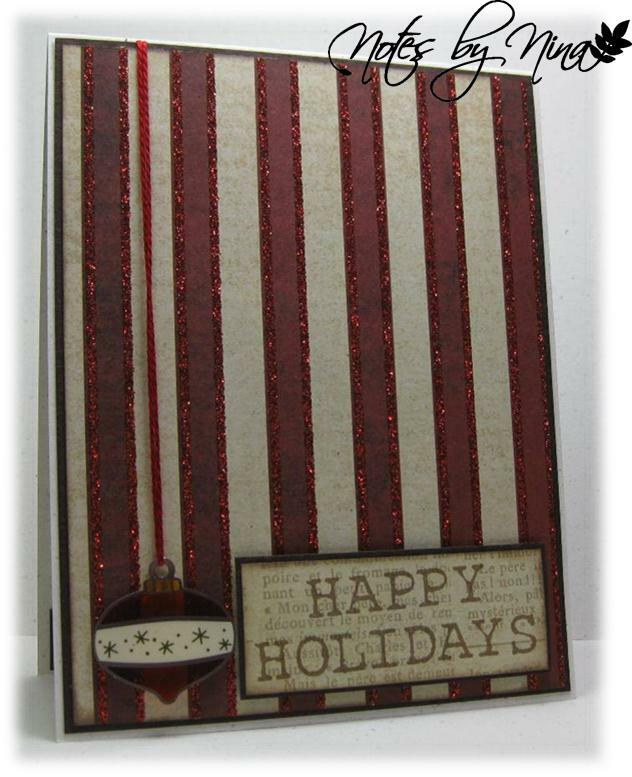 Supplies: Cream and brown cardstock, Designer Paper-Cosmo Cricket, The Stamps of Life-houses4us, HOTP-Mix your Messages, misc punches and gems, embossing folders. Happy Friday everyone, how exciting that it is the last Friday before Christmas... Are you ready :)? 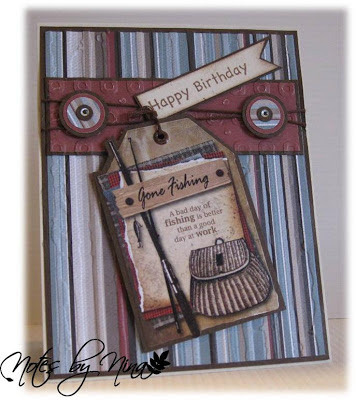 It is a Just for Fun challenge over at Scrapbooker's Paradise, Playing in Paradise, I could not resist creating a card with this fantastic fella. I wanted my snowman to look a little uneven, I mean what snowman looks perfect when you make them right. So I used my VersaMark marker to add embossing powder here and there to get the look I wanted. I of course used lots of layers and even popped the little tag up with foam tape. I finished with a twine and a little snowflake embellishment. Please stop by the Playing in Paradise blog to see what the challenge team members have created, and some holiday memories they have shared. Supplies: Cream and red cardstock, designer Paper-Carta Bella, Cosmo Cricket-Jolly Days, misc twin, snowflake and pearls. 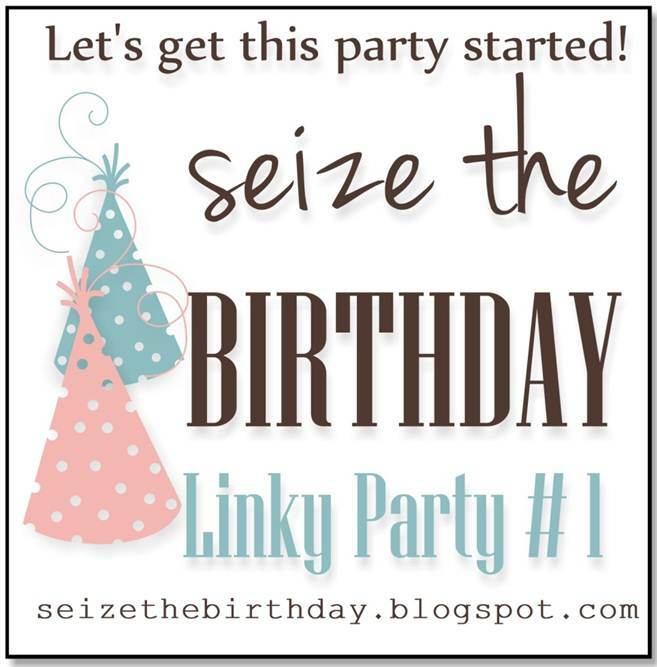 A quick card this evening, I had a few minutes to craft and I wanted to share this card I made for the first Linky Party for Seize the Birthday. 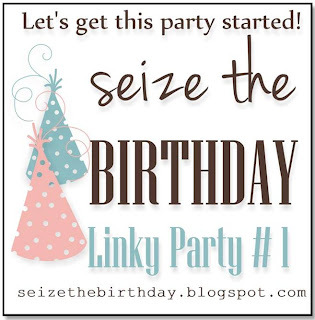 I have depleted my stash of Birthday cards so I am so excited about this new challenge. 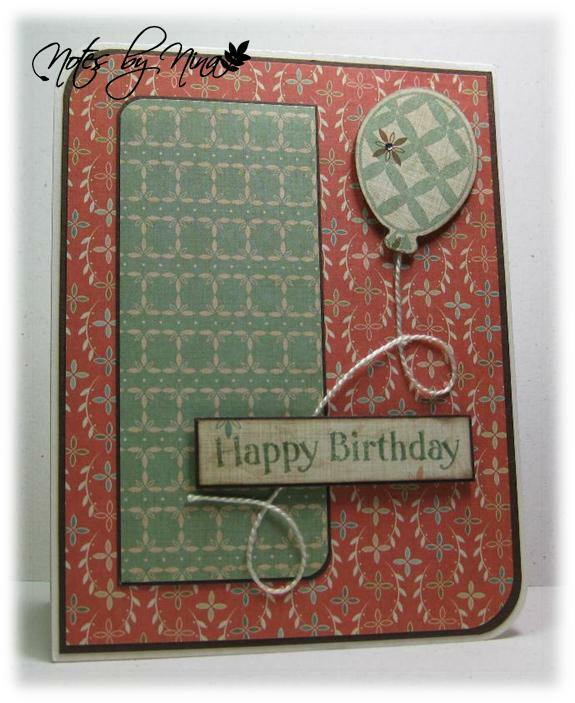 Supplies: Cream and brown cardstock, Designer Paper-Cosmo Cricket, The Stamps of Life-Ballons2cut and birthday2celebrate, misc gem and twine. I am tired and still fighting the icky cold so comments will need to wait till tomorrow :). Happy Friday everyone, we are well into Dec now and Christmas is peaking around the corner at us. I have not reached holiday excited yet, but the rounds of Christmas Parties start this weekend for us. Vacation was fabulous but I brought me home a little bug, my immune system has taken a beating in 2012. I have had more coldlike bugs this year than in the last 5 combined. I hate it, I am the first to admit I get grumpy when the germs come calling. Anyhoo, enough of my grumbles. We have a new Playing in Paradise Challenge and Allison has a brand new sketch for us. I found myself in a happy place with my Christmas cards this year, I make a new one every week throughout the year so I have a good supply. When I saw this sketch with the little snowflakes though, I could not resist and I really don't think I will have a problem finding a home for it. I have all my 6x6 Christmas paper pads on the side of my desk within easy reach. 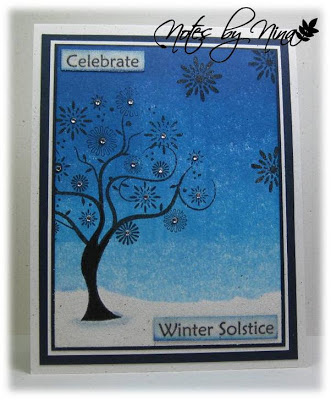 I used a die cut to create this darling little tree, I added some little details like stamped and punched snowflakes, gems and ribbon. Please be sure to visit this week Playing in Paradise Challenge, our Challenge team has some wonderful projects that are a great inspiration. You can also join in the fun to win a prize. 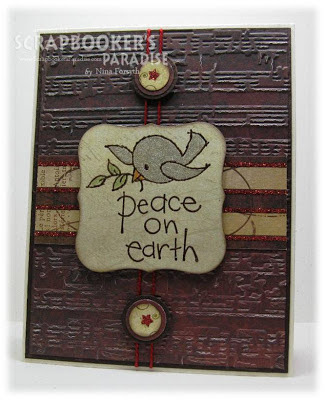 Supplies: Cream and brown cardstock, Designer Paper - Carta Bella, HOTP- Christmas art, misc ribbon, gems and punches, Spellbinder and Dee's Distinctively die cuts. I made this card a couple of weeks ago but did not get a chance to post it, I have had a week away and now I feel so behind on my cards. I hope to get a little crafting time in this week in between getting everything put together for the holidays. 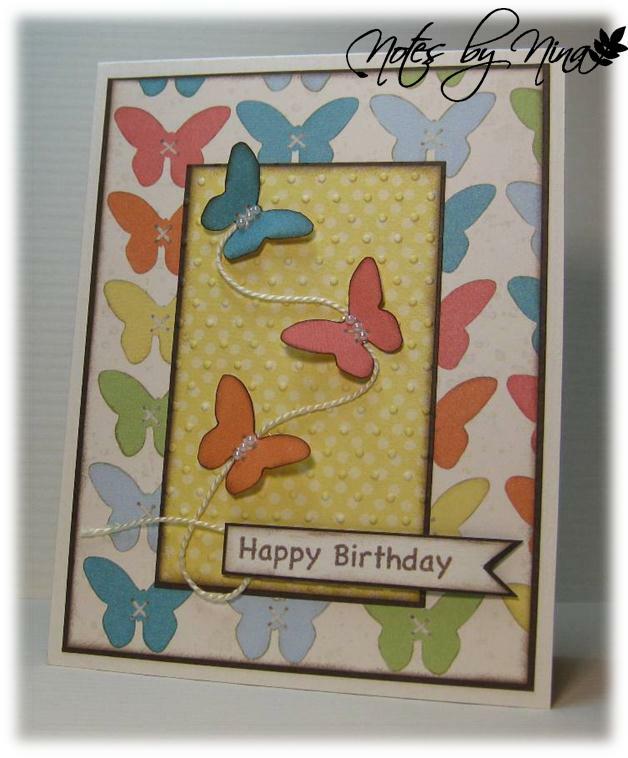 I wanted something bright a cheery for the card, so I used this paper from Close to my Heart, I hand cut a few of the butterflies from left over DP then glued them to the twine. I finished by adding a few tiny pearls to each body. Supplies: Cream and Brown cardstock, Designer Paper –Close to My Heart, Hot of the Press - Tiny Words, Embossing folder, twine and pearls. A very quick post this morning along with another simple card for Merry Monday. 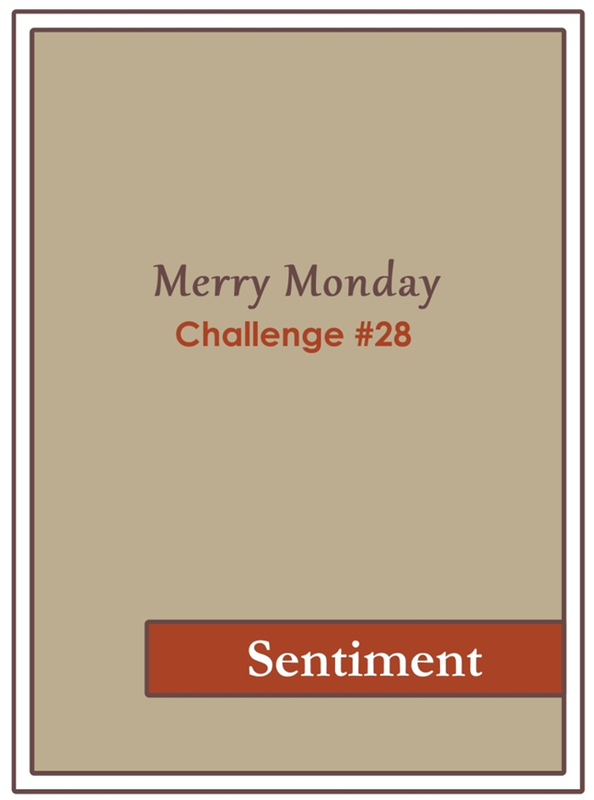 I used the Merry Monday Sketch #28 for a second week in a row. I love how it makes for a nice quick card. I have had these Lil' charms for years and finally decided to make use of one. Instead of using the attached brad I threaded some twine through it and popped it up with foam tape. 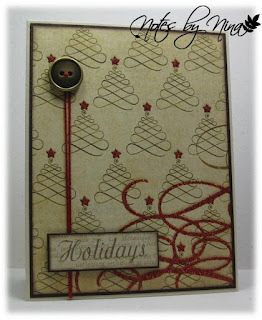 Supplies: Cream and brown, Designer Paper - My Mind's eye, twine, Lil' Charm, Hero Arts - Get Merry. There is still time to play Merry Monday two week Challenge, a year in review. Happy Friday :), as this posts (I hope) I am enjoying a vacation in Las Vegas, I have to assume I am having a great time. 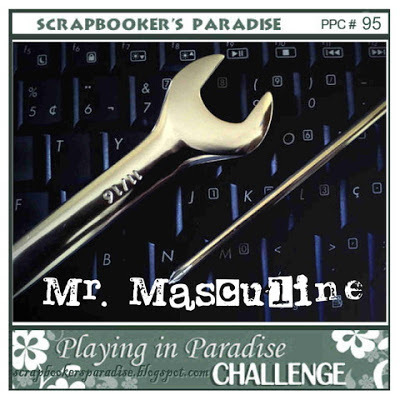 It is time for a new Playing in Paradise Challenge and Jessi is our hostess. We are challenged to be inspired by Winter birds. I have to admit Cardinals or Whiskey Jacks are the winter birds that come to mind for me, the second because we see them when we snowshoe at the Mt. Washington Resort here on the island every winter. Our outings are not quite the same without getting to feed the greedy Whiskey Jacks. I have this adorable stamp though that I could not resist using. I added some texture to the background. The little bird is coloured with a Clear Star jelly roller for lots of sparkle, the center frame and buttons are popped up with foam tape. Supplies: Cream and brown cardstock, Designer Paper-My Mind's Eye, Stampendous-Peace Birdie, misc twine, circle punches, Spellbinders. 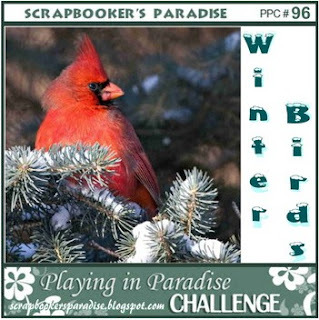 There is still time to play along with the Playing in Paradise challenge for this week. This is a second card I made for this challenge.. I used scraps for this card so I am unsure of the designer paper, I found some fishing stickers in my stash too. I made a couple of buttons from circle punches and added fish hologram eyes. Supplies: Cream and brown cardstock, Designer Paper - Unknown, HOTP-Tiny Words , Twine, circle punches, hologram eyes, sticker. Although the Merry Monday Challenge is done for 2012, we are using one of the past sketches to post for a year in review. 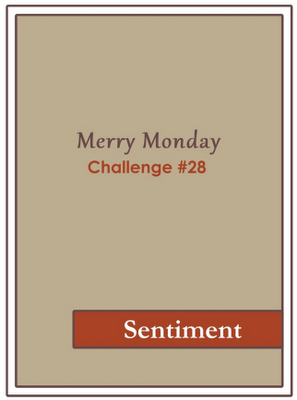 I chose to make a simple card with this past Merry Monday sketch. I am back to going through my scraps, I seem to have a ton from My Mind's Eye. I let the paper have all the glory and added a sentiment and a little twine with a button. Supplies: Cream and brown cardstock, Designer Paper - My Mind's Eye, Twine, button. Stop by Always Playing with Paper to see what Lesley and the Design Team members have created.